Figma figures became an abundance in my collection after stumbling on Mari. I realized just how wide their reach is in terms of female characters so when I found out that they had KOS-MOS, I had to get her. Well, with how impressed I was with KOS-MOS, I just had to get her 'evil' counter part: T'elos. Well, let's not delay, let's jump right in! Figma boxes. Something of the norm! Standard and nothing we need to spend too much time on. Much like her 'Holy' counter part, T'elos comes with an intricate amount of details. The dark color combination is quite intriguing; the tanned skin really is complimented by her burgundy, and violet colors. To add a bit of contrast(a prominent one too), T'elos has bright white hair that truly fits her. Reminds me of Pirotess! Then again, KOS-MOS and T'elos do have that Deedlit and Pirotess rapport going on. Well, going back to the figure, T'elos can't stand on her own. Or at least, it is very difficult. 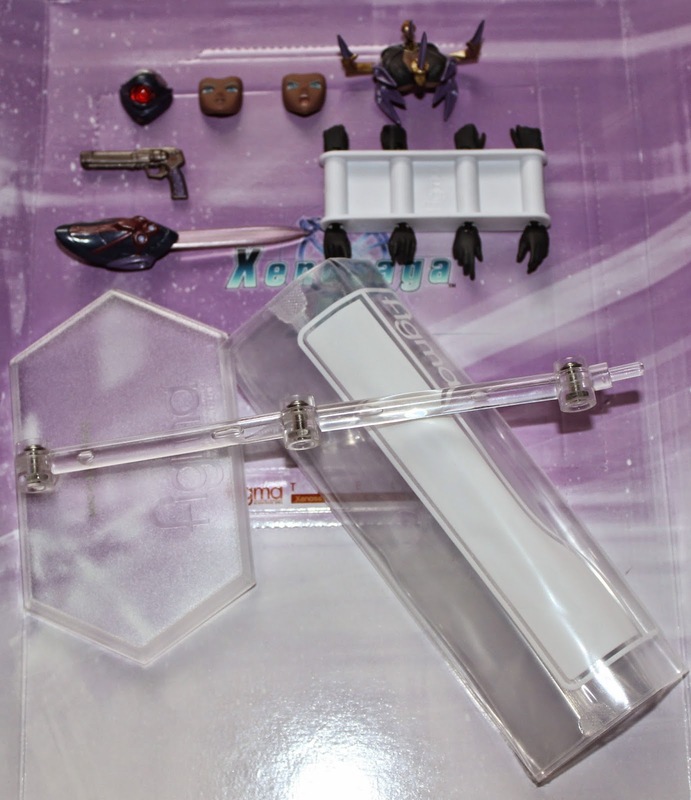 Speaking of accessories, right off the get go, it's pretty obvious that she doesn't have the same amount as KOS-MOS. She lacks the weaponry, and to be exact, she only has two weapons while KOS-MOS comes equipped with a handgun, blade arm, a blade/laser gun(I assume), and two colossal battling guns. Though with the expected hand variations, the face swaps, the chest piece, and the stand included in T'elos' box, I would say the accessory department isn't lacking just smaller compared to her 'lighter' counterpart. She comes with three facial expression: angry, serious, and smirking. All beautifully done and consistent in all painting aspect. One little thing, I forgot to take a close up of her other 'headpiece' swap with the red dot covering the majority of her face. I'll try to point that out later when I get to the pictures but yeah. Basically it just looks like she has ONE gigantic red eye. The chest piece should be no secret by now. It mirrors KOS-MOS' and since I have watched the video of these two going at it, I am more than aware of what it really does! Basically it's her 'uni-beam' akin to Iron Man's signature chest blast, though T'elos has something more promiscuous to show off with this chest beams. Just like KOS-MOS', the little detail added to this is appreciated, albeit it could've gone with a special affect to truly capture the intent. Oh, the picture above has the 'targeting' headpiece on. Again, it dominates the majority of T'elos' face and leaves only her lips to be seen. T'elos' left arm comes with a 'gauntlet' of some sort that allows the transparent blade(matches her color scheme too) to be attached to it. It's basically just like KOS-MOS' interchangeable blade arm. For some reason, this one wasn't as cooperative as I want it to be, but when able to pose right, it does look rather amazing. I don't quite remember if T'elos' blade had a bit more 'energy' feel to it, but this one is a bit linear and at some aspect, it's rather insipid. Though it does do the trick, but I feel like it lacks. Also, putting on some of her hands with the gauntlet piece provides some tedious work that shouldn't exist when swapping hands. Small gripe, but a gripe nonetheless. The handgun is also part of T'elos' weaponry(and I think she also has a gattling gun, but it's not included in this figure) and detailed as it is, it's not a wow factor. I have the same feelings for KOS-MOS handgun and it transfers over to her rival. I do believe T'elos uses this in Xenosaga III and I believe all in all, it's pretty accurate. Maybe I'm getting spoiled with special affects that Figma usually provides when characters deems it necessary... I think T'elos could use a few fire power affects but, meh. Her articulation is something to admire! I think Figma(and most import toys) are so good with this that one can almost always replicate some of the characters' movements and/or signature gestures. T'elos was nimble, agile, and downright powerful in the game so her Figma version can capture the majority of her game glory! One of these days I'll try and snap some of those trade offs that she and KOS-MOS had with these two figures! For sure a fun task if I ever get the time! As always, the stand provides much more dynamic! Being able to support T'elos' weight can offer much elation to someone who is willing to spend time really getting some poses out of her! I barely scratched the surface, and I'll be redundant in saying that she and KOS-MOS will be aesthetically pleasing when posed together in battle! In conclusion, I think I had much more 'negative' things to say about T'elos becuase she came AFTER KOS-MOS. Lacking some weaponry does put her down a bit and with some of the gripes I had with KOS-MOS carrying over, it's not exactly the best picture for T'elos. Though I will say this, I love this figure. She is almost half the price of KOS-MOS, and as a figure on its own, T'elos delivers accuracy, superb visuals, and minus hte two enormous guns her counterpart carries, T'elos does provide her signature weapons. With that said, great figure. Great job Figma!